Common household bleach will remove or fade the color of a sweater made of a sturdy natural fiber -- such as cotton, hemp or linen. However, some commercially dyed garments are colorfast to varying degrees, and bleach can damage animal-based and synthetic fibers including wool, silk, nylon and polyester. So before bleaching your sweater to white, conduct a swatch test to determine how successfully the color can be removed. Prepare a fiber test. 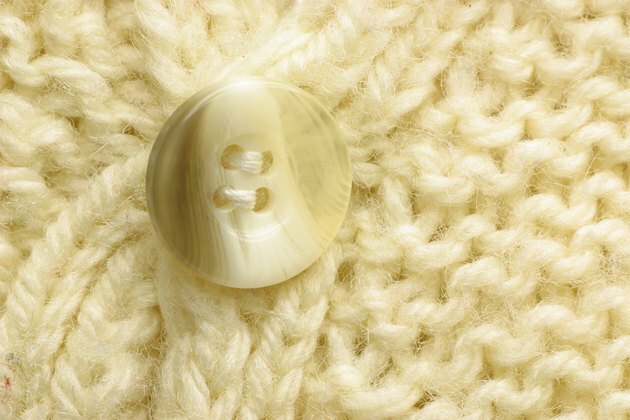 Snip a swatch of the yarn or fabric from a seam of the sweater. Put on rubber gloves, and mix a small sample of bleach solution -- using one part bleach to four parts water. Measure the length of the swatch, and immerse it into the bleach solution. Let sit for 10 minutes. Remove the swatch from the bleach solution, and let it air dry. Examine the color to ensure it meets your approval, and inspect the fibers to be sure they were not weakened by the chemical. Measure the swatch again to check for shrinkage. Fill four buckets: one with 1 cup of bleach per gallon of water, two with plain water, and the fourth one with a bleach neutralizer -- sodium thiosulfate. Mix the neutralizer according to directions. A neutralizer halts the chemical action of the bleach on the garment. Immerse the prewashed sweater into the bleach solution. The bleaching process begins after 2 minutes, and the garment should not be left in the solution longer than 10 minutes. Remove the garment when you are satisfied with the color, and dip it into the first bucket of plain water. Saturate it with water, wring it out and immediately submerge it into the bucket filled with neutralizer solution. Allow it to sit for 15 minutes. Remove the bleached sweater from the neutralizer bucket, and drop it into the last bucket of clean water. Rinse thoroughly. Then wash the sweater as usual. Allow it to dry in the sun, if possible. Substitute commercial bleach neutralizers with 3 percent solution hydrogen peroxide. Pour enough hydrogen peroxide over the garment to fully saturate it. Let the sweater sit for 15 minutes. Then rinse, and wash as usual. Bleach is a hazardous chemical and caution should be used when handling it. Conduct the bleaching procedure in a well-ventilated area, to avoid inhaling fumes.